Migrants have no dedicated advocate within the fractured landscape of the UN system. Could that be changed? 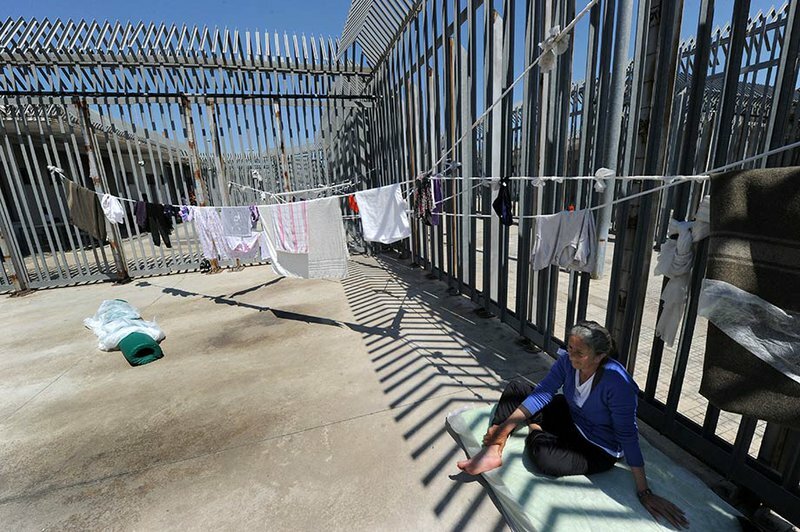 A woman from Georgia waits in the Identification and Expulsion Center of Ponte Galeria, a detention complex on the outskirts of Rome, Italy in 2014. Vandeville Eric/ABACA/PA Images. All rights reserved. On 22 February US President Donald Trump issued new deportation rules to find, arrest and deport irregular immigrants in the United States who have been convicted of any crime. The Mexican Foreign Minister, Luis Videgaray, responded by stating that Mexico will go to the United Nations to defend the rights of immigrants in the United States. Interestingly, that sort of response has been the exception. Very few commentators have looked to international institutions to advocate against Trump’s deportation policy, or his earlier executive order severely restricting immigration from seven predominantly Muslim countries. This is likely due to the fact that the international advocacy infrastructure around migrants’ rights is weaker than in most other advocacy issue areas. However, in the current context of surging nationalist populism, the need for a new convention on migrants’ rights and a competent entity to oversee, promote and censure violations of these same rights is becoming ever clearer. None of the existing international institutions are adequately mandated, financed or supported to explicitly protect migrants’ rights. This article outlines the map of institutions mandated in whole or in part to cover global migration, some gaps in the current normative and institutional framework, and recommends creating a new convention to strengthen migrant rights’ advocacy at the international level. A patchwork of institutions and treaties is involved in the articulation and defence of migrants’ rights. Within the United Nations Common System (UN), the International Labour Organisation (ILO), the United Nations High Commissioner for Refugees (UNHCR), the UN Department for Social and Economic Affairs (DESA), the Global Migration Group (GMG), the Office of the United Nations High Commissioner for Human Rights (OHCHR) and a collection of special advisors and rapporteurs all address the issue of migrants’ rights to varying degrees. Additionally, the International Organisation for Migration (IOM), is a major player, in its own right, in the migration field. Each actor has different competencies, which are detailed below. However important gaps remain, as none of these entities is adequately mandated, financed or supported to protect migrants’ rights across the board. The International Convention on the Rights of All Migrant Workers and Members of their Families (Migrant Workers’ Rights Convention) was adopted by the UN General Assembly on 18 December 1990 and entered into force on 1 July 2003. Article 74.5 of this convention entitles the International Labour Organisation (ILO) to contribute expertise (through the sending of representatives with a consultative capacity) to the Committee on the Protection of the Rights of All Migrant Workers and Members of Their Families (a UN treaty body composed of independent experts) that is tasked with overseeing the implementation of the convention by its state parties. However, this convention is too limited in its target group and has never received sufficient support to qualify as a robust protection mechanism. It does not cover irregular or undocumented persons, students, trainees, stateless persons, refugees, or those fleeing generalised violence or natural disasters. Moreover, only 50 states have ratified the treaty, fewer than most other major UN human rights conventions. In addition, these 50 states do not include either the US or any other western state. Thus this treaty holds little legal sway in many countries where migrants’ rights are under threat. Support for the Might Workers’ Rights Convention stands in stark contrast to state support for the 1951 Refugee Convention and its 1967 adjoining Protocol. With 148 state parties to one or both of these instruments, the convention and protocol provide a robust normative foundation for the protection of refugee rights. However they are only applicable to the small group of people who meet the onerous ‘refugee status determination’ threshold. As a result, even though the convention and protocol have broad international support, including from most western states, these documents do not protect the rights of migrants more generally. The narrow focus of the Refugee Convention and its 1967 adjoining Protocol directly shape the mandate of the Office of the UN High Commissioner for Refugees (UNHCR), the inter-governmental organisation which oversees these instruments. UNHCR has, in practice, extended its support to some forcibly displaced groups that do not meet the Refugee Convention criteria. However, the organisation has also been quick to distinguish between the needs of these “persons of concern” on the one hand (i.e. stateless persons, internally displaced persons, and persons under temporary, complimentary or humanitarian protection) and the rights of migrants on the other. The UN Department of Economic and Social Affairs (DESA) is another player in the field of international entities concerned with migration. It is the home to the UN’s migration unit and produces yearly statistics on global migration patterns. However, DESA is largely headquarters-based, short-staffed in its migrant functions, and traditionally more focused on research and data production than on advocacy or operational activities. Stretching across the various agencies, funds and programmes of the UN is the UN Global Migration Group (GMG) – an inter-agency body composed of 21 entities. To date, it has performed largely a coordination and information-sharing function for different parts of the UN system and for the Global Forum on Migration and Development (GFMD), an inter-governmental and civil society forum on global migration. Given that it lacks an explicit advocacy mandate, it is unlikely that the GMG can play the role of advocate-in-chief for migrants’ rights in its current form. The Office for the UN High Commissioner for Human Rights (OHCHR) provides a vocal advocate at the UN for migrants' rights through its high commissioner, Zeid Ra'ad Al Hussein. The high commissioner has challenged states to develop a rights-based agenda for migration which “recognises the humanity and the human rights of all migrants, regardless of their status, and fulfil[s] the obligations of international law”. Moreover, OHCHR provides logistical support to the UN treaty bodies responsible for monitoring the implementation of important international human rights treaties revolving around the following themes: (i) the rights of documented migrant workers and of their families (through the Migrant Workers' Rights Convention); (ii) the rights of children; (iii) the prohibition of torture and of other inhumane and degrading treatment; (iv) civil and political rights in general; (v) economic, social and cultural rights in general; (vi) the prohibition of gender-based discrimination; (vii) the prohibition of racial discrimination; (viii) the rights of disabled persons; and (ix) enforced disappearances. Yet, these UN treaty bodies exercise oversight over the treatment of migrants by state parties only to the extent that a situation involving migrants falls within the specific material scope of these various international human rights treaties. As yet, no international treaty or treaty body specifically regulates or monitors the protection of migrants’ rights as a whole regardless of their migration status or of whether they belong to another vulnerable group protected by international human rights law. This gap in the international legal framework hampers advocacy efforts. Finally, there are various UN special rapporteurs charged with defending migrants’ rights including: the special rapporteur on the rights of migrants; the special rapporteur on the human rights of internally displaced persons, and the secretary-general’s special representative for international migration. These individuals are experts in their respective fields and operate with a great degree of independence. While the efficacy of individual advocates varies, the structure of the post itself can limit these envoys’ overall impact: the UN appointees are assisted by few if any full-time staff, hold only temporary mandates, and write reports that states too often ignore. The International Organisation for Migration (IOM), another actor in this field, was originally established outside the UN and has no provisions in its constitution to defend migrants’ rights against state abuse. IOM’s constitution stipulates (in article 1.3) that control of standards of admission and the number of immigrants to be admitted are matters falling within states’ domestic jurisdiction. In carrying out its functions, therefore, IOM must conform to the laws, regulations, and policies of the states concerned rather than hold them accountable to normative standards of treatment regarding migrants. As a result, IOM has functioned broadly as a service provider for states rather than as a monitor and promoter of the rights and needs of people on the move. Furthermore, IOM has limited autonomy, as over 95% of its financing is earmarked by states for specific programming. In 2016, the UN General Assembly adopted a resolution paving the way for IOM to become a “United Nations related organisation”. While this brings IOM slightly closer to the UN fold, IOM’s mandate continues to be explicitly “non-normative”. Despite the presence of all of these players within the global migration field, a strong, institutionalised voice defending migrants’ rights is missing. This advocacy gap is filled, in part, by civil society groups, which advocate on migrants’ behalf at the meetings of the GFMD and elsewhere. But civil society, of course, lacks an inter-governmental mandate or the power to conclude international treaties on its own. Therefore, there remains a need for a dedicated, well resourced, institutionalised advocate with an explicit mandate to articulate, promote and defend the rights of migrants against state violations. Recent developments could improve global advocacy in this area. First, in September 2016, all 193 heads of state met at the UN Headquarters in New York for a high level summit on refugees and migrants. This summit generated the ‘New York Declaration’, which called for the creation of two global compacts, one concerning “safe, orderly and regular migration” and the other concerning responsibility sharing vis-à-vis refugees. As part of this declaration, states re-affirmed their commitment to the human rights of migrants and refugees “regardless of status” (paragraph five). DESA and IOM were appointed to shepherd the migration compact to fruition, with a target date of end of 2018. Civil society and academia will be feeding into the negotiation processes. Delivering a strong global compact on migration is an important first step. To this end, a small group of migration-related entities, including many of those outlined above, are working with the Office of the President of the General Assembly and the Office of the UN Special Representative of the Secretary-General for International Migration to shape the consultation process for the global compacts. As part of this consultation, a series of thematic debates will take place. The first of the thematic debates, to be held in early May, will focus on human rights in the context of migration. A global compact, however, is not legally binding on states, and therefore needs to be supplemented by an additional step: if the international protection of migrants’ rights is to be made as robust as that of other vulnerable groups, states would need to negotiate a general convention on migrants’ rights. While the current Migrant Workers’ Rights Convention is limited in the type of person it covers, the rights conferred by this convention are nevertheless sufficiently broad in scope to serve as a source of inspiration for the elaboration of a new general migrants’ rights convention. The current migrant workers’ rights convention is too limited in its target group and has never received sufficient support to qualify as a robust protection mechanism. This new general migrants’ rights convention would need an oversight authority. IOM could be given this responsibility, just as UNHCR is responsible for monitoring compliance with the Refugee Convention and its Protocol. In this scenario, IOM could remain simply “affiliated” to the UN and thereby continue to proceed without the bureaucratic encumbrances associated with membership in the UN common system. Such a setup would have its benefits, as it would anchor IOM’s activities in a normative framework, centred on migrants rather than on states. In other words, the needs of states would no longer simply “Trump” migrants’ rights. Is it unlikely, however, that states would entrust IOM with such a role and unclear whether IOM would be willing to oversee such a convention given its existing constitution. Alternatively, the mandate of OHCHR could be extended to cover the monitoring of the new general convention on migrants’ rights. Although OHCHR does not have IOM’s thematic or operational expertise on migration, it is one of the few UN entities with an explicit and unapologetic mandate to advocate for and assess states’ compliance with internationally recognised human rights. A dedicated convention and a dedicated treaty body secretariat would provide both a universal platform against which to judge state action and a team of independent experts responsible for advocating adoption of and compliance with the convention. Populist leaders are increasingly dominating the narrative when it comes to migration and the risks posed by immigrants. More should be done to combat that narrative and put in place concrete safeguards for migrants across the globe. A general convention on migrants’ rights housed within an appropriate entity, while not constituting a direct counterweight to the current expulsions and bans, would be an important step in challenging populist narratives and promoting the rights of some of the world’s most vulnerable people. This article, originally published 6 March 2016, was re-published with minor modifications from the authors on 26 March. The views expressed are those of the author and do not reflect the views of the United Nations University.